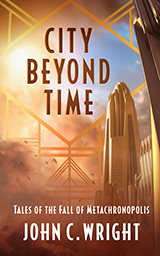 City Beyond Time: Tales of the Fall of Metachronopolis is John C. Wright’s mind-bending and astonishingly brilliant take on time travel. In making use of a centuries-spanning perspective similar to his highly-regarded Awake in the Night Land, Wright expertly weaves a larger tale out of a series of smaller ones. Part anthology and part novel, City Beyond Time is fascinating, melancholy, frightening, and a true masterpiece of story-telling. John C. Wright has been described by reviewers as one of the most important and audacious authors in science fiction today. In a recent poll of more than 1,000 science fiction readers, he was chosen as the sixth-greatest living science fiction writer. EPUB or MOBI format. No DRM. 168 pages.